There are more ways than one to dry flowers at home – you really don’t need an airing cupboard. Hang bunches up to dry, or lay flower heads flat on kitchen paper. Drying flowers in my airing cupboard – check out the use of pencils, rubber bands and clothes pegs! I have both hanging space for flower stems, and flat drying shelves covered with kitchen roll. Although I have space in my workshop for large-scale drying when needed, I still like to use my airing cupboard for smaller projects such as my pressed flowers, and drying experiments. I’ve been asked a few times recently what people can do if they don’t have an airing cupboard for drying flowers – I know I’ve mentioned mine quite a few times in my blog posts. I have an old fashioned house with a hot water tank in a cupboard in one of the bedrooms, with shelves around it for storing linen. I cleared away most of the linen and have pretty much commandeered the space as my own. 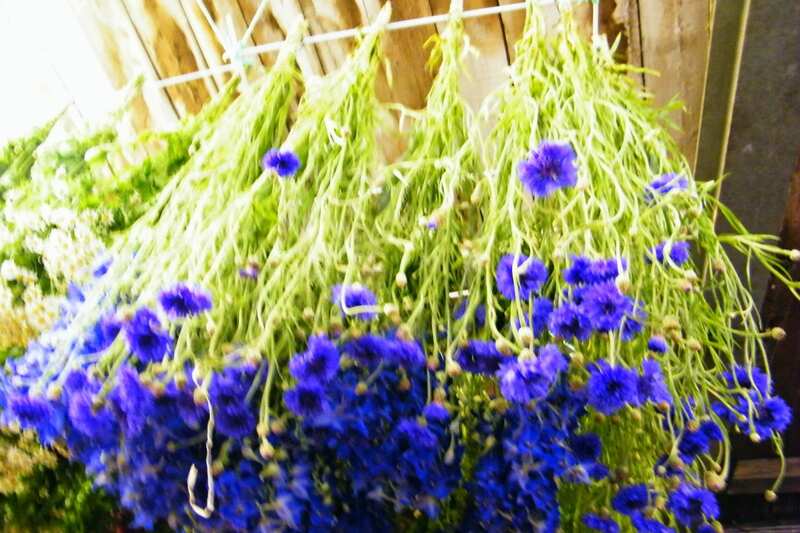 Cornflowers hung up to dry in my workshop last year. Garden shed – this can be really good in the warmer months as sheds that are not 100% shaded warm up during the day to desiccate your flowers, and their drafty nature is a bonus in this situation where good airflow is needed. Just watch out for leaky roofs spoiling your collection! Garage – very similar to the above. In both cases, it’s best to avoid storing the plants in there long term, in case they become damp in the colder months or are damaged by insects. Spare room – make sure the radiator is on in that room, and leave the door open a little to improve air circulation. Above a radiator – if you have an inconspicuous corner, hang some flowers up above the radiator to dry, but beware of radiators below windows as they can lead to inconsistent temperatures and fading of the blooms. If you have a radiator cover which acts as a shelf, lay out flower heads to dry flat on some kitchen roll. Kitchen – get a decorative herb hanger and make a feature of your flowers drying in full view. Kitchens are a good place to preserve flowers as they are often very warm – but keep the plants away from sources of strong sunlight and steam. 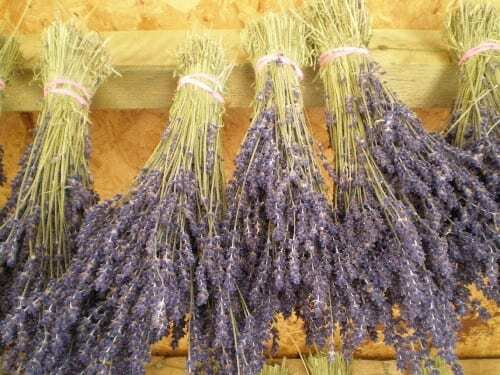 Lavender bunches drying in a shed. Greenhouses and bright conservatories – although the flowers dry quickly, they are also likely to fade severely and become unusable. Unheated rooms in the winter – cold and damp will probably just make the plant material rot. Cupboards – these don’t usually have the air circulation required to preserve the leaves and blooms successfully. 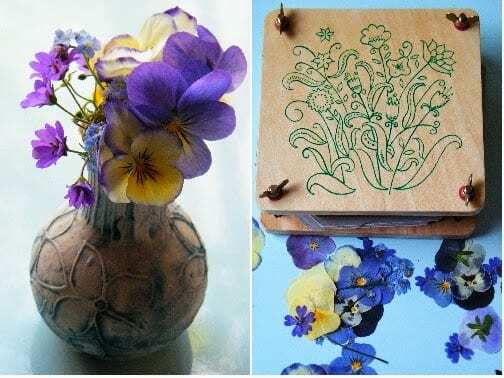 Flower press – you can use this pretty much anywhere but warmer rooms help the flowers to dry quickly in the press. Microwave flower press – you need to buy a special press for this but it is much quicker. Desiccants – try submerging your blossoms in a desiccant like silica gel sand to dry. Again, this method can be sped up by combining with a microwave. If you choose the right flowers at the right time of year, the act of simply placing them in a vase of water can be the first step to drying them – for instance hydrangeas. Pressed flowers don’t take up much space. So there’s no excuse – get drying! please could you tell me out much weight of dried flowers I need for 30-40 cones. Hi Karen, Sorry for the delay in replying, I was on holiday. The answer is a bit variable because it depends on the size of your cones, and what petals you are using. One handful of rose petals is about 10g, so if a cone holds 2 handfuls, then 30-40 cones will need 600-800g. Delphinium petals are much lighter and lavender is slightly heavier. Please feel free to email Mike in the office sales@daisygifts.co.uk at our shop if you need more specific help. Thanks, Ruth. Hi Ruth, I’m so glad I’ve found your site, it’s inspiring me do much. I’ve been growing flowers and dry them yearly but didn’t realise that you can dry so many varieties. I’m currently drying zinnias,a long with other flowers they shrivel but still retain the colour. I’m a keen British flower Grower my self and have to admit I’m obsessed with all things flowery. Thanks for commenting Sandra! I love experimenting with different flowers. I haven’t tried zinnias yet, but they are such lovely bright colours, I will have to soon. I just pick anything in my garden and try it, because it hardly takes any time to do. Keep on drying!